Aqua Lung equipment has been used for many years by Public Safety dive and rescue teams worldwide and has a reputation for reliability, performance and durability. Core breathing system products such as Apeks regulators provide field-proven capability and performance for SCUBA and surface-supplied diving operations in all environments. Key dive accessories, including fins, diver knives, masks and snorkels, have become benchmark products for the professional diver and the Aqua Lung group continues to develop equipment designed to meet the needs of the Public Safety market. The Osprey is a feature loaded breathable surface rescue suit designed with durability and mobility in mind offering superior fit and comfort. 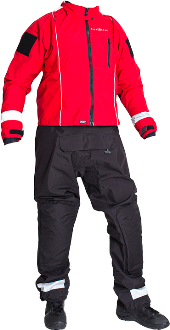 The suit is designed for long duration water rescue events in swiftwater, flood, boat operations, and ice rescue missions. The material and construction has over 7 years of proven field use in various aquatic environments. These suits are special order. Please allow additional lead time.